Keep duty rigs secured at the waist where they belong with the help of a set of Heavy Duty Belt Keepers from Tru-Spec. Fully loaded rigs can get heavy, real heavy, and as a result they often sag and can begin to separate from their liners. This can inhibit the wearer's mobility as well as their access to weapons and other important gear. This is where Tru-Spec's belt keepers come in. Featuring heavy duty snaps and a military-grade nylon construction, the keepers wrap around the rig and liner and lock it into place. The extra support ensures that all sidearms, radios and tactical equipment is right where it needs to be. 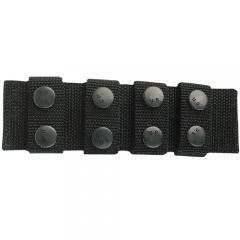 The straps are weather and abrasion resistant to stand up to the rigorous demands of daily tactical use. Better than what I had. These belt keepers are tough and stay snapped. Made of thick nylon and brass snaps. Also, you can't beat the price. I'll be back for more. Great, the fit is perfect and snaps hold very tight. Awesome gear works great. Sturdy and dependable.